One of my team members celebrated their birthday last week and this was the card I sent her to celebrate. This was my first chance to play with one of the new stampsets I received at Onstage called Dragonfly Dreams. I stamped the little bees with black ink and coloured them with my So Saffron marker before fussy cutting them out. The floral paper is from the Subtles paper stack and I used one of the dies from the Rose Garden Thinlets to cut out a rose. 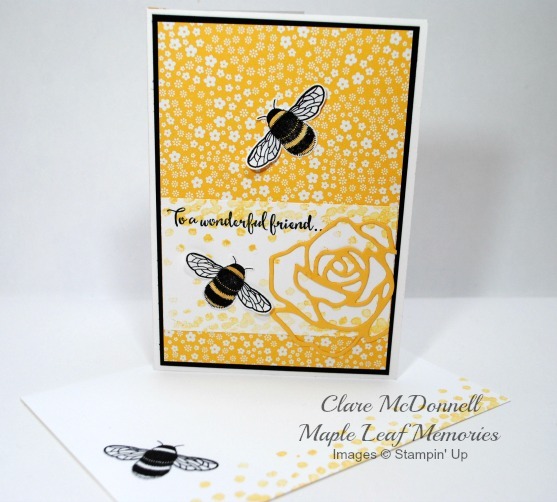 I used another of the stamps from the set stamped in So Saffron ink to achieve the Bokeh effect on the white card. And of course I had to stamp the inside of the card and envelope to match!